﻿ How much money do bloggers make? A couple of months ago, I explained how and why I blog TL;DR - I do it because I enjoy it. Most pages on my site host a single skyscraper advert (Look, there’s one on the right -> just over there!) I exclusively use Google Adsense to provide the advertising content. Today I’m going to share a few stats about the revenue I earn from these adverts. But first a little soap-box. Doesn't it seems a little weird that the people who say you can make a lot of money are all people who claim to be experts on this and derive all their traffic from people asking this question? Outside of flashy pages telling you how much money you can make, or how they can sell you the secrets to be successful, their blogs don’t really have any content other than the pages that tell you how successful they are at blogging! (and remember, if you visit these sites you are generating revenue for them even if you don’t take up one of the affiliate offers on their site). It’s like watching those late night TV infomercials about how to start a business and make money, and self referentially, they make money by selling the system about how to make money! What most people seem to be looking for is an estimate for how much money an ‘average’ blogger with a moderate amount of traffic could expect to generate. From there it’s possible to scale up to see how much traffic would be needed to get to the self-sustaining dream of full-time blogging. Dive a little deeper into the search results and you find postings from the opposite end of the spectrum. There are postings for people who are making no money, and their comments are desperate pleas for help. They’ve either read about the blogging gold-rush, drunk the Koolaide, or are just bewildered as to why they are not making the money that the dream sites’ claim is there for harvesting. Articles from this latter group of people are subdivided into two types: Those that have no traffic, and those that have traffic, but just aren’t making much money. Are the people not making a lot of money the minority or the majority? You can read the pain and disappointment in the first sub-category of posters. They explain how they’ve tried really hard and have passed over the 100 PVs (Page Views) threshold a day, but can’t seem to grow their site more. They’ve been creating content consistently and are following all the rules that the “how-to” experts claim are the secrets, but they’ve never earned more than a few pennies with adverts and are far short of the $100k/year the dreams promise. Blogging is writing. Blogging is content creation. In today’s knowledge economy it’s like the writing of books/magazines in the last century (but even easier to do, as the barrier to entry to blog is so low; today anyone can publish to the internet. In the past there were other hurdles to cross to get published). Not everyone will be a JK Rowling and make millions with their writing. For every successful author who makes a living with their craft, there are tens (hundreds?) of thousands of vanity book authors who never make a dime. It just doesn’t scale that way (and it can’t). It, mathematically, does not make sense that every one of the 100 million+ bloggers on the internet can make a living from their writing! Not every author is going to write a Harry Potter series. Not every blogger is going to create a Huffington Post. OK, enough of the doom a gloom. As promised, here are some authentic stats about my blog. I’m sharing these openly so you can have an honest reference point for what my blog earns. Maybe you can approximate how larger/smaller your blog site is on a pro-rata scale. I’m not trying to sell you anything. I’m not trying to promote my services as a blogging/SEO expert. I’m not trying to boast. I’m simply sharing my experiences as a blogging hobbyist. As a Data Scientist I also realize that, with just this one data point, it’s a pathetically useless sample to draw any conclusions from. Take what you can from my data, but understand it is just one drop in the internet ocean. I’ll not put my email address directly in this article, but if you are a warm-body you’ll probably be able to find a way to contact me. If you want to email me and share your blog sites’ traffic/earnings, I’ll working on compiling them for a future article where I can aggregate lots of data points to produce a more detailed report. I must admit I’m a little curious as to where my site earnings fit in the constellation of other blogs. Am I average, ahead of the curve, or behind the curve? Over that last couple of years, I’ve slowly built up my blog traffic. Traffic can be very spikey. If I get an article discussed on a site like Hacker News, Reddit, Popular Science, or one of the larger news portals, I can get 10x-100x increase in page views for a couple of days. If a sample window contains one of these ‘supernova like’ event it distorts things, but as an order of magnitude my blog is currently receiving approximately 3 Million Page Views/year. *The primary spike was caused by the the Impossible Escape article which got picked up by many sites. All of my revenue comes from advertising. (Some other bloggers generate additional revenue from affiliate marketing, or generate money from sales, commissions, referrals and other network schemes. I don’t do any of these. All my revenue comes from my Google Adsense account). Typically advertisers like to quote something called CPM. Confusingly this acronym stands for “Cost Per Mille”, which means cost per thousand (In Latin, Mille means thousand, not Million). An advertiser who wants to put an advert on your site will bid on a price for 1,000 impressions. This is the CPM. However, this is not the money you receive because Google has to take their cut of the transaction. It would have been easier if everyone could have standardized on a term like RPM (revenue per thousand) for the money the site owner receives per impression, but instead the term used is eCPM (for ‘effective’ CPM). This is confusingly close to CPM that often the terms get co-mingled and/or the ‘e’ dropped. Bottom line – If you are talking about these numbers with people make sure you clarify what it is they understand them to mean so you are on the same page. Worry about what the figures represent, not what they are called. It officially gets a little more complex on the purchasing side as adverts are bought depending on if they are charged per impression, per end-user click, per acquisition … Read more on the web if you want to know about things from the other side of the fence. eCPM, however, is still pretty easy. It’s one thing divided by another. If you site hosts 5,000 advert impressions and you earn $1.25 from this, your eCPM is $1.25 ÷ 5 = $0.25. eCPM really is a useful and easy to understand metric: If you know the number of page views you got, and you know the eCPM, you can simply multiply them to get your earnings. I’ve only recently put adverts on my site (I held out for a long while). For this article I ran a query of the lifetime earnings (LTV) for every page on my site with more than 1,000 page views (PV) in the last 24 months. LTV is the best metric to measure because you have no idea when one of your articles is going to get trendy. Sure, I publish with regular frequency (typically about once a week), and yes, I have a core of subscribers/followers who consume/share/post/tweet/like each new post as soon as it comes out, but it’s not uncommon for an article I’ve written quite a while ago to suddenly get featured or referenced and it gets a second wind, or a third … (sometimes these later ‘echoes’ generate significantly more traffic than the initial release of the page. My site is not a ‘news’ site and articles I write are typically not time sensitive: they are just as relevant at any future time). For every 1,000 page views, I’m earning about three quarters of a dollar. Not all pages are equal. It’s in everyone’s interest to target adverts. The more targeted an advert, the better the chance of conversion. The advertiser is happier; he receives more click-through. The broker is happier; he can charge a higher premium for each impression. The blogger is happier; she receives more money for the space carved out for adverts. The end user is happier; she receives more appropriate adverts that better mesh for her interests. To help with this targeting, Google (in my case), parses through my pages and examines the content of each page. It makes a guess as to what the topic of the page is and, combined with demographics of the browsing user (and other meta data), and past performance, and lots of other secret sauce, determines what the type of content is best displayed in the advert slot. It then brokers my page to advertisers who bid of how much they are willing to pay for the privilege of having their advert displayed on my page. The bottom line is that different articles I write have different earning potentials. If I write about a topic that is of interest to advertisers, an advertising slot on that page could, in the massive auctions that occur behind the scenes, result in a higher eCPM for that page. Each potential advertisers determines what that are willing to pay, and the auctions balance these needs out. As I blog for fun, I never bother to chase these different eCPM, but if maximizing is your goal, you might want to take this into account. The risk you run is that pages that are of interest to advertisers might not be the pages that are of interest to your readers. Each of my pages has a different eCPM. Some of this is rounding, and some is down to the fact that I’m a relatively small site and just the variance in bidding over a few thousand page views will make a difference. However, the range, even within my site, is pretty broad (Remember to be in this report there must be at least 1,000 PV). That's almost two orders of magnitude difference. So, which pages on my site generate the most absolute revenue? Remember, revenue for each page is the product of PV × eCPM. We’re looking for the geometric maximum. Do the pages that are the most popular with my readers (have the highest PV) generate the most revenue? Does volume win out? Do the pages that are most popular with advertisers (have the highest eCPM) generate the most revenue? Are my most profitable pages the ones that are a hybrid mix of being both popular (even if not the most popular page) and being of high interest (even if not the highest eCPM)? Does it happen to be that the most popular pages on my site also happen to be the most desirable to advertisers? Below is a graph showing the 188 pages on my blog (at the time of writing) with >1,000 Page Views. (I’m only examining data from the date I inserted adverts onwards; the last 24 months. 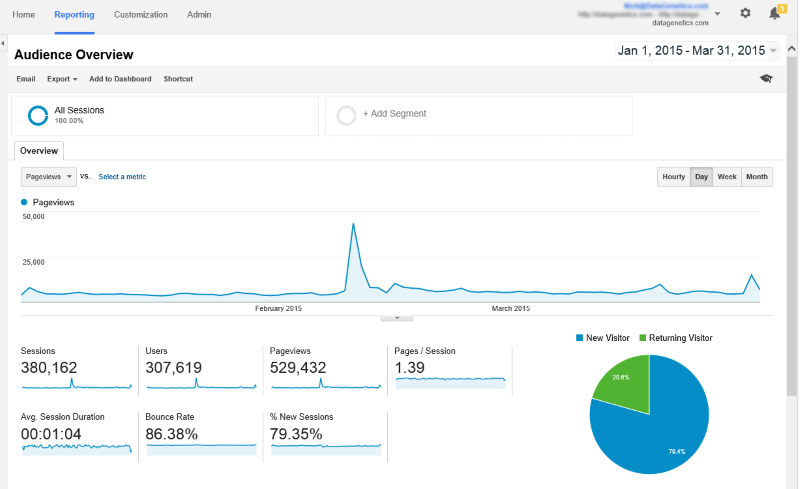 So the graphs represents Total Page Views over the last 24 months, and the corresponding revenues). The x-axis shows Page Views (I’m using a log scale). The y-axis shows LTV (lifetime value) in dollars. The graph is interactive, and if you hover over a prominent point you will get the title of that page. If you click on graph point, a link will appear underneath which can be used to open that page in a new tab. Readers on tablets and other touch devices will not get hover over tips. (The graphs are busy, so not every point has meta data). The red line depicts the average eCPM of $0.76 (which on a linear graph would be a straight line with that gradient but, because I’m using a log scale, this average line is rendered as a curve). My highest revenue generating page is also my most viewed page (but interestingly, it is at a lower eCPM than the site average (it’s below the red line). This makes a bit of sense. The reason this page is incredibly popular is that it is about a topic that is of general interest to a wide range of people. This includes people further away from my core demographic and these people are less likely to click on adverts. The next highest revenue generating page is not the next most popular page on my site, it’s the fourth most popular page. It has only 12% of the PVs of my most popular page, but its eCPM is 5x higher, so the product of these means it generates more than half the revenue of the top performing page with far fewer impressions. The third highest revenue page is right on the average eCPM. This is the directory page for all my blog articles! I have some high volume pages that are generating very little revenue (such as my third most popular page which has a pathetically small eCPM of $0.25, despite being viewed well over 100k times!). This page, however, is special. This particular page is results page from my Wheel of Fortune puzzle solver application. It's a PHP page generated with the results, and when people are on this page they are going backwards and forwards as they are tweaking the results and modifying the puzzle. It's not a surprise that this page has a lot of PVs, but not much revenue. Below is a different way of graphing this data. It plots the LTV (lifetime revenue generated by the page), against the eCPM; It doesn’t care how many PVs there were, it simply plots the value of each page against the eCPM. The super high performing eCPM pages aren’t the largest revenue generators. Pages on my site that appear to be appealing to dating site advertisers, car advertisers, Consumer electronic manufacturers, and credit card companies command some of the higher eCPM rates. Finally, here is a plot of the eCPM against the Page Views. Very generally, for my site, the pages that have the higher eCPMs are some of the lower viewed sites. This might make some sense, as these smaller viewed pages might be more niche in nature, appealing to a more specific demographic, from which Google is able to command a premium from advertisers. There are also a couple of obvious outliers. It's great that I have a good day job because, unless I can increase my readership by at least two orders of magnitude, then there is no way I could earn enough money to sustain my family by blogging! Having said that, my blog generates enough revenue to pay for all my internet hosting costs, and there's enough left over for a few steak dinners every year. Plus, I enjoy doing it!